Copyright it! 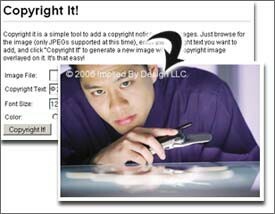 is an easy-to-install, easy-to-use PHP script that adds copyright notices to your images. Copyright It! comes as a pre-built script you can add to your web site as added functionality to your web site, or you can just use it yourself to generate copyright text on your own images. Copyright It! is easy to install. Just unzip and upload, or if you're using it on a local server, just unzip! Choose your copyright text, the font size, even the color! Copyright It! adds a copyright notice right on the image, making it a challenge to remove. Copyright It! has a nice temporary file system, so your hosting account doesn't get overloaded with files. PHP be installed with the GD library.